As an artist, I am concerned with the issues that have direct relevance to the life of humans. According to psychological theories, everyone consciously and unconsciously attempts to protect themselves from anxiety and social restrictions. This is often defined as a Self-defense Mechanism. The act of the Self-defense Mechanism caught my attention in regards to how an individual communicates and engages in social interaction. I feel everyone creates a bubble, which they can live inside. This bubble protects their mind in situations, in which they cannot cope. However, it can also negatively impact a person’s ability to deal with anxiety in reality and causes an isolation of an individual in society. Therefore, an emotionally healthy person has to find a balance between self-protection and self-isolation. In my “Living With Bubbles” series of work, I use glass to create multiple types of bubbles, which can be interpreted as metaphors for different types of Self-defense Mechanisms. Bubbles take on different properties for everyone; bubbles can be cages, which can trap people; bubbles can be cocoons, people are sealed in temporarily; bubbles can be ironclad, with people struggling to break out, and bubbles can also be fragile, which people can break with just a touch. I use glass to make visible the unseen self defense mechanisms of people. My sculptures are made to represent the emotional state of people living with bubbles. 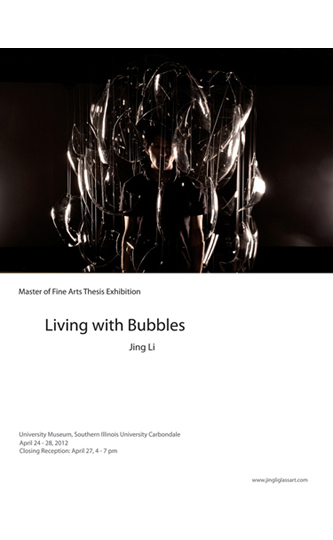 The works in “Living With Bubbles” can be a way for people to see a manifestation of bubbles in their own lives. My work was inspired by the industrial glass and modern architecture materials. I was born and raised in China. Because of the economic development and the urbanization, more and more places have been replaced by curtain wall skyscrapers in the cities. As people miss this disappearing nature architects design plants, water, and rocks as components to fit into the modern architecture. For me, they become the element of man-made environments and not of the real nature. The artificial nature as a component of architectures reminded me another art form, bonsais. A bonsai is an miniature of nature that people can approach, manipulate, and appreciate. I use clear and mirrored glass, stainless steel accessories, and concrete to fabricate Bonsais that have strongly industrial characters. I hope my work represents the conflict between natural and man-made environments.